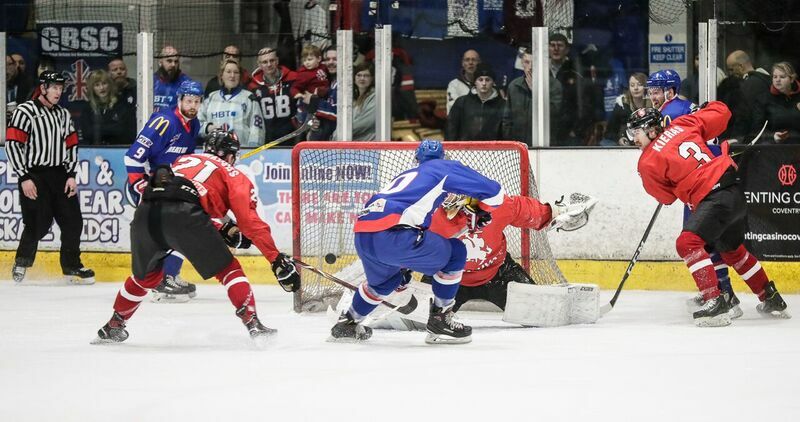 Robert Farmer netted twice for Great Britain, but it proved to be another disappointing night as Lithuania took the win in a 7-2 success at Coventry’s Skydome. Lithuania were first on the board inside the opening five minutes when Paulius Gintautas cut inside from the left to give them the lead. But soon GB found themselves two down when Emilijus Krakauskas tapped in at the backdoor to beat Jackson Whistle, getting his first start for GB. The home side got back in the game when Brett Perlini shot was finished off by Farmer score on the rebound. Nottingham Panthers forward struck with an equaliser shortly after with a backdoor finish and parity was restored for Russell’s side. Arnoldas Bosas scored to put Lithuania in front on an odd-man rush followed by Edgar Rybakov restoring the two-goal lead soon after. Another from one-time Sheffield Steeldogs player Bosas barely a minute after the second interval put the Lithuanians firmly on course for the victory. Then Dainius Zubrus added a sixth with Krakauskas finishing past Thomas Murdy in the net for his second goal and Lithuania’s seventh on a good night for them. GB head coach, Pete Russell, said afterwards: “I was disappointed with the result but it was good to get some of the young players out there.